The Asian/Asian American Studies (AAAS) Student Leadership and Community Action Faire engages the Laney College campus community in an open dialogue about current issues relevant to the Asian American experience today, and it celebrates the contributions of Asian Americans to the diversity and history of the United States. 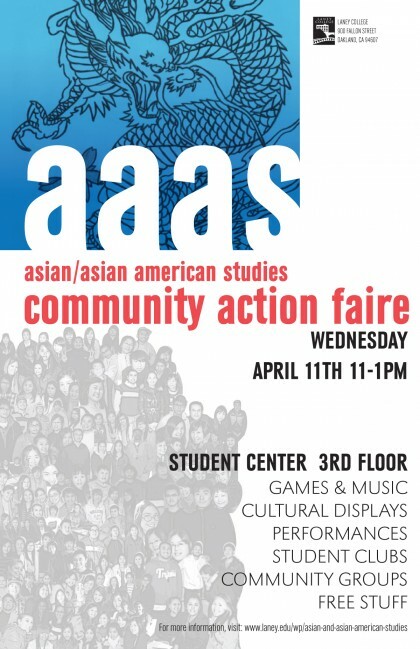 Organized by students enrolled in AAAS courses and sponsored by ASLC and the Student Life Fund, our multi-cultural event will be produced in the Spring semester on Wednesday, April 11, 2012. AAAS students work in small groups to design and develop educational, political, and cultural displays showcasing their team’s many talents and generous gifts. Through active participation, leadership skills and coalition building, our students are creating and validating their voices at Laney College and in the surrounding Oakland community. More details forthcoming!